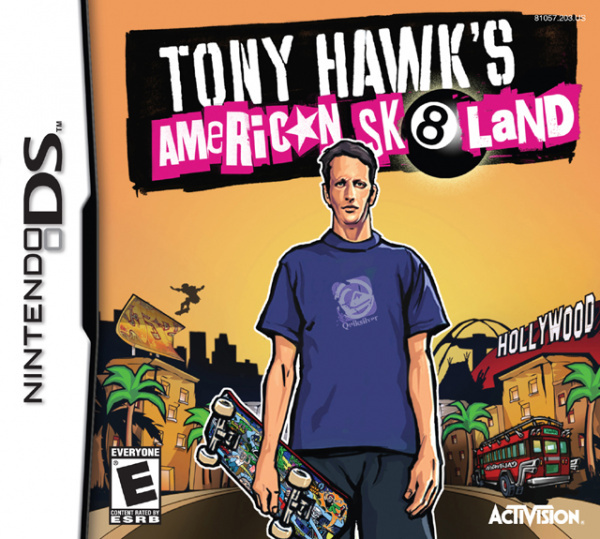 Sorry, no review of Tony Hawk's American Sk8land yet. 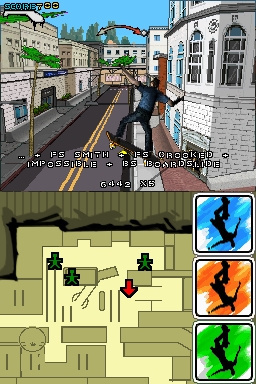 Designed to take full advantage of the Nintendo DS, Tony Hawk's American SK8Land is the first 3D Tony Hawk game experience for a Nintendo handheld system. 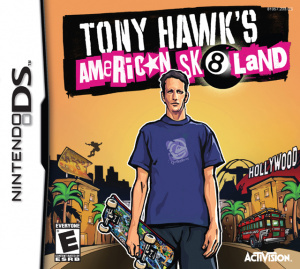 Featuring a unique cell-shaded art style, players must prove themselves to Tony Hawk and other legendary pros as they undertake hundreds of skating goals set in seven popular areas of Los Angeles and restore the ultimate skate park, American SK8Land, to its former glory. 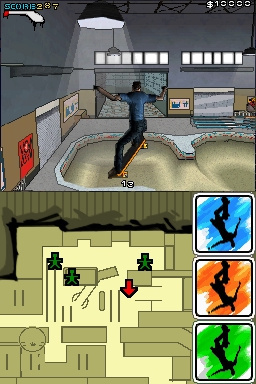 The game challenges players to complete signature skate tricks that have been made popular by the Tony Hawk franchise, and also includes exclusive features such as wireless online multiplayer, voice in-game and touch-screen capabilities. Wireless Multiplayer - Two players can go head-to-head via a wireless connection and battle through several modes: Trick Attack, Score Challenge, Combo Mambo, The Price is Wrong, Horse and more. 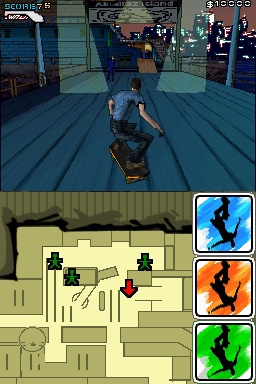 WiFi - Fans create a handheld Hawk community where they can skate head-to-head against other DS players online, post and download high scores and statistics, as well as replay "ghosts," which teach gamers new skate runs, combos and other moves done by others in the WiFi Hawk community. Players can also play against the "ghosts." 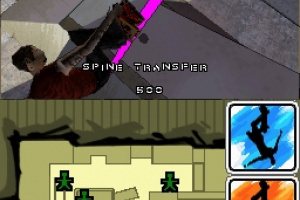 Voice In-Game - Players can record voices that replay in the game when players bail, perform a special trick, or clear a gap. Map Screen - Detailed top screen displays the main gameplay, while the bottom screen displays information such as a level map with collectable locations, dialogue, tips and hints. 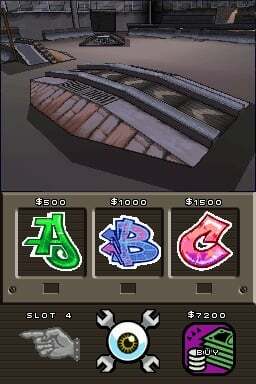 Graphical Editors for "Create-A" modes - Draw with the DS stylus to customize various game elements (deck art, graffiti tag). 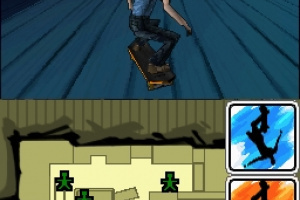 The bottom screen provides a canvas and color palette, while the top screen shows the finished decal (rotating deck, logo). Trick Slots - Perform special moves using the touch screen. During gameplay the touch screen presents "trick slots," which slides in or out depending on whether the skater's special meter is full. 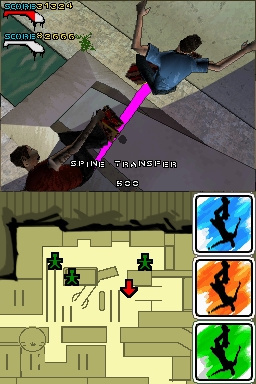 Special tricks may be executed when one of the slots is touched. 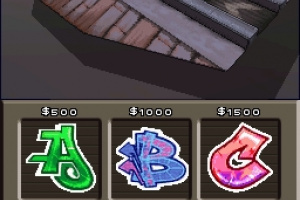 Players can customize their "trick slots" by assigning tricks from a list available via the skate shop. Freak Out! (Tantrum Mini-game) - Players can recover lost combo scores when they bail and win a dramatic speed boost by touching and stopping three pulsing columns as close to the top of the column as possible. 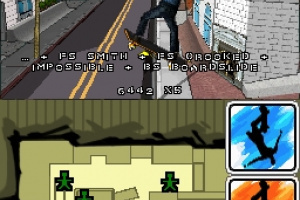 The columns will appear on the bottom screen when a gamer bails or the game can be initiated by bringing the skater to a complete stop. Create-A-Park - Players earn money through story mode and buy new equipment for their custom skate park. 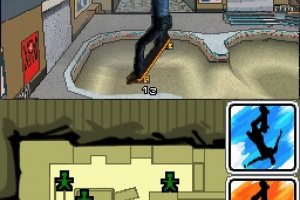 More than 1000 different skate park designs are possible using the intuitive touch screen based create-a-park editor. Classic Mode - Compete against a timer to clear as many objectives as possible in two minutes.